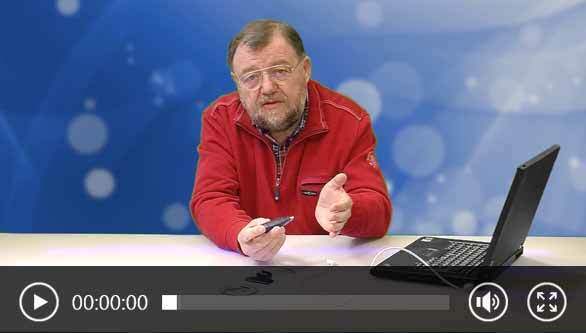 Video: How Does a Hygrometer Work? A hygrometer is a device used to measure humidity. Many hygrometer products also measure temperature. A hygrometer that measures both humidity and temperature often is referred to as a thermo-hygrometer. PCE Instruments (PCE) offers a wide variety of hygrometer products used to measure the relative humidity of the air. Since humidity is an important factor in many sectors including but not limited to manufacturing, agriculture, construction, restoration, remediation and heating, ventilation and air conditioning (HVAC), PCE also carries a number of hygrometer devices designed for specific applications such as measuring the humidity in bales of pressed hay or in rolls of paper. A hygrometer also can be used to evaluate heat stress risk in hot work environments like boiler rooms, factories, construction sites and commercial bakeries. To accurately assess heat stress risk, a hygrometer capable of detecting and classifying temperature in relation to the amount of moisture content in the air is recommended. The global standard description for heat stress is the Wet Bulb Globe Temperature Index (WBGT). A combination hygrometer / thermometer, or thermo-hygrometer, can be used to verify the integrity of the cold chain during the transport and warehousing of refrigerated food and pharmaceutical products. This versatile and popular style of hygrometer also is ideal for evaluating the performance of HVAC systems in industrial, commercial and residential properties. If the humidity indoors is too high, mold can occur. Certain types of mold cause respiratory problems and other negative health effects for people living or working in the surrounding environment. In addition, mold that has permeated into the walls or roof of a structure must be removed for safety reasons. Mold remediation and removal, also called mold damage restoration, can be a costly endeavor, which is why preventative monitoring of the humidity indoors is preferable whenever possible. If you have any questions about the hygrometer products on this website, please contact us at or +44 (0) 2380 987 035 for PCE Instruments UK, or at or +1 (561) 320-9162 for PCE Americas Inc. The hygrometer PCE-VDL 16I from PCE Instruments measures and stores the relevant measured variables: temperature, relative humidity, air pressure, light as well as acceleration in three axes by means of a vibration sensor. Therefore, this hygrometer is ideal for monitoring vibrations on machines while simultaneously measuring and recording the relevant environmental conditions of the system. The PCE-HT 71N Hygrometer Data Logger detects air temperature and humidity and stores readings in its internal memory. The Hygrometer Data Logger has a compact format and a wide memory capacity (up to 32,000 values / 16,000 values for each parameter) and it is mainly used as a Data Logger in fields such as supermarket refrigeration units, refrigerated transport, warehouses, and other temperature controlled environments. PCE-WB 20SD is a multifunction data-logging hygrometer. This hygrometer measures indoor / outdoor wet bulb globe temperature (WBGT), black globe temperature (TG), wet bulb temperature (WB), dew point temperature, air temperature (TA) and relative humidity. Thus, this multipurpose data-recording hygrometer is an ideal tool for evaluating heat stress risks in different work environments. With the PCE-320 Hygrometer it is possible to measure climate conditions such as temperature and relative humidity, as well as determining surface temperature of objects simultaneously by using the included external temperature sensor or using an infrared measurement. The Hygrometer offers features such as average value, maximum, minimum, and hold functions at a reasonable price. The PCE-313A Hygrometer measures relative humidity and temperature and can be used in the air-conditioning sector. The PCE-313A hygrometer can be connected to type K thermo-elements to detect, for instance, the temperature of a wall by means of a surface probe. The internal memory of this test equipment allows the hygrometer to record humidity and temperature data at an adjustable measurement interval. Thanks to its SD memory card (1 to 16 GB) the humidity test instrument can be used for long term data acquisition. PCE-HVAC 3 is a multifunction hygrometer or diagnostic measuring device used for indoor climate and environmental monitoring. 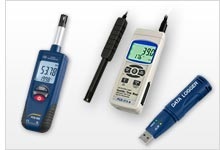 In addition to measuring relative humidity and ambient room / dry-bulb temperature, the meter calculates dew-point and wet-bulb temperatures in degrees Celsius (°C) and Fahrenheit (°F). Thus, heating, ventilation and air conditioning (HVAC) installations and HVAC system performance assessments are key applications of the PCE-HVAC 3 meter. The PCE-FWS 20 Hygrometer Station is a multi-functional wireless digital device that will exceed your expectations. This manufacturer-calibrated meteorological instrument accurately measures temperature, relative humidity, precipitation, atmospheric pressure, wind speed and wind direction. Featuring a free-standing or wall-mountable touchscreen LED display with backlight, the PCE-FWS 20 makes a fantastic gift. The Hygrometer combines various functions and sensors in only one instrument: Air Humidity Meter, Wind direction, Wind speed, Temperature meter, rainfall, and data logger. Furthermore, the meteorological station has different alarm functions and settings for the measurement parameters. The measured data can be sent by radio to the base unit (max. distance of 100 m). This test instrument is equipped with the latest technology used in meteorological analysis. The touch screen allows you to recall data onto the screen easily. PCE-VA 20 is a multifunction hygrometer for assessing wind, weather, indoor / outdoor environmental climate conditions as well as for testing heating, ventilation and air conditioning or cooling (HVAC) systems. This combination anemometer-hygrometer-thermometer features a 10 cm / 3.9" Ø fan impeller, easy-to-read backlit LCD, and functions such as display hold, average value, maximum value, minimum value, battery-saving automatic power off, low-battery indicator, and metric or imperial unit selection. The PCE-FWS 20 Hygrometer is for private and professional use. This meteorological station allows the accurate detection of wind direction, wind speed, temperature, relative humidity and precipitation. The USB port and the included cable allows transmission of data from the device to a computer. Software for analysing data is also included, which enables you to analyse and check meteorological fluctuations, presenting data in graphs and diagrams for measurements over prolonged periods of time. The multifunction hygrometer PCE-THA 10 is easy to operate with one hand thanks to its compact size, the new structure and integrated impeller. In addition to the humidity, the hygrometer measures the temperature, wind speed, dew point, the wet bulb temperature and the air volume. Average wind speed values can be determined with the hygrometer from the 20 preset points. The PCE-VA 20 is a versatile multifunction hygrometer for determining environmental conditions such as wind, temperature and humidity. It is additionally used to test heating, ventilation and air conditioning / cooling (HVAC) systems. This triple thermometer-hygrometer-anemometer device has a 10 cm / 3.9" Ø fan impeller and a clear backlit LCD. Available functions include display hold, average / maximum / minimum value, auto shutdown, low-battery warning, and metric / imperial choice. The PCE-VA 20-SET is a multi-functional hygrometer including flow hoods for assessing and balancing heating, ventilation and air conditioning or cooling (HVAC) installations. This multi-faceted anemometer-thermometer-hygrometer incorporates a 10 cm / 3.9" diam. fan impeller, easy-to-view backlit LCD, and useful functions, e.g. display hold, average val, maximum val, minimum val, auto power-off, low battery indication, and imperial/metric option. The hygrometer PCE-HT 50 is suitable for continuous monitoring of the room climate. This is how the hygrometer finds its application in homes or at work. The hygrometer has an internal sensor for air temperature and humidity. The Hygrometer PCE-TH 5 is a universal temperature / humidity gauge which allows the measurement of both the ambient temperature and the ambient humidity, as well as the determination of the dew point and wet bulb temperature. This hygrometer is sent out manufacturer calibrated and can also be optionally certified to ISO standards. The PCE-BTH 10 is a compact and easy-to-use Bluetooth hygrometer. This Bluetooth hygrometer is characterized by its simple one-button operation and integrated interface. The Bluetooth hygrometer PCE-BTH 10 measures the air temperature and humidity. The PCE-HT 71N Hygrometer detects air temperature and humidity and stores readings in its internal memory. The Hygrometer has a compact format and a wide memory capacity (up to 32,000 values / 16,000 values for each parameter) and it is mainly used as a data logger in fields such as supermarket refrigeration units, refrigerated transport, warehouses, and other temperature controlled environments. The following text is designed to assist you in purchasing a hygrometer. However, should you have any questions about the hygrometer products found on this website, please do not hesitate to contact the PCE technical support team at or +44 (0) 2380 987 035 for PCE Instruments UK, or at or +1 (561) 320-9162 for PCE Americas Inc. Accuracy is a key component to consider when buying a hygrometer. When looking at different hygrometer devices, it is important to evaluate the hygrometers based on the level of accuracy required for your application, as a high-accuracy hygrometer product typically comes with a higher price tag. For example, a high-accuracy hygrometer would be essential for a food safety inspector, as stringent standards must be met when it comes to food storage and refrigeration. In contrast, if you are in search of a hygrometer for use in your home, a device with lower accuracy would provide you with an adequate estimate of the relative humidity indoors. For temporary humidity measuring applications (such as simple control measurements, spot checks to assess concrete drying conditions, or evaluations of heating, ventilation and air conditioning (HVAC) system performance), a portable handheld hygrometer without memory may be used. Portable hygrometer devices often are ergonomically designed to allow for quick, easy and comfortable one-handed operation. For long-term or continuous monitoring of relative humidity, a fixed hygrometer with memory and data-logging capabilities is ideal. Many fixed hygrometers with memory record and store date- and time-stamped humidity measurement data either to an internal memory or a removable SD memory card. Depending on the model, some hygrometers for continuous monitoring also record and store peak values (minimum and maximum) and/or emit an alarm when a certain user-defined threshold of air humidity is reached. Most data-logging hygrometers allow the stored data to be transferred to computer using special software, a USB or RS-232 interface cable and/or an SD memory card reader. Data transfer to a computer makes documentation and reporting easy, as measurements do not have to be written down by hand. In addition, some hygrometer products save the data in a Microsoft Excel-compatible format. 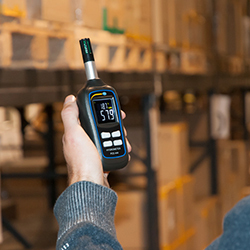 Stationary hygrometers used for the continuous monitoring of climate-controlled environments like refrigerated trucks, storage units, warehouses and museum archives are used to survey indoor environmental conditions in the context of safety and quality assurance. Hygrometers with memory also aid in documenting an organization's compliance with industry standards and best practices. Hygrometers for permanent installation usually come with the necessary brackets or hardware required for mounting the device on a wall or DIN rail. Often a fixed-installation hygrometer instrument is equipped with a kickstand or tripod, so the device can be positioned as needed on a desk, table, counter or workbench. If it is necessary to read the humidity measuring results from a distance, a hygrometer with a large and easy-to-read liquid crystal display (LCD) should be selected. In addition, when working in low-light or dark environments, it is critical that the display be backlit. Again, application plays an important role when selecting a hygrometer. For non-professional use, a simple hygrometer that only needs to be switched on to start measuring is recommended. Most professional usages will require a hygrometer with more advanced functions. Bear in mind, the more functions a hygrometer possesses, the more complex the hygrometer will be to use. However, experienced contractors, technicians and engineers will be more than comfortable using a hygrometer with added functionality, as digital hygrometer menu structures are somewhat standardized throughout the test, measurement and inspection equipment industry. If a hygrometer has many different functions, it can be helpful to have several buttons or keys on the device, as more keys can provide time-saving shortcuts for navigating a device's menu structure. In just-in-time (JIT) manufacturing environments, even the smallest time savings can be a tremendous asset. Another point to consider regarding keys is their size. For example, in the food processing industry, bigger keys are desired to accommodate users required to wear protective gloves. The hygrometer's material and ingress protection (IP) rating are additional factors to explore before buying. Depending on the anticipated operating conditions, your hygrometer may need to be made of a durable material such as high-quality ABS plastic. Your hygrometer's housing also may need to be dustproof or waterproof. The IP rating system is a widely recognized set of international standards related to an electronic device's ability to protect against the intrusion of foreign bodies. This rating is typically presented as the letters I and P followed by a two-digit number, i.e., "IP##." The first digit of the number pertains to solids (dust), while the second digit pertains to liquids (water). The higher the digit, the greater the level of protection afforded by the device. Lastly, don't forget to evaluate the hygrometer's power supply and accessories. If your hygrometer is powered by batteries, the batteries should be a commonly used size so they are easy to find and affordable to replace. If your hygrometer is powered by an AC adapter, take care to ensure the power cable won't interfere with other aspects of your work environment. Many PCE-brand hygrometers offer replacement parts like spare batteries, sensors, cables and adaptors as optional accessories. In addition, an ISO calibration certificate can be obtained as an accessory for most PCE-brand hygrometer products. The term hygrometer comes from the Greek words hygro (meaning “wet, moist; moisture”) and metron (meaning “a measure”). Thus, a hygrometer is a device used to measure moisture in the air, i.e., humidity. 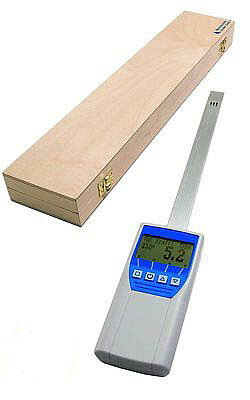 In modern measuring technology, a hygrometer often is used in combination with a temperature measuring instrument. The measured values for relative humidity and temperature can be used to in tandem to measure dew point or water vapor content. Frequently, a hygrometer also is mistakenly referred to as a hydrometer. However, these two types of testing devices do not have much in common. In contrast to the hygrometer, which measures humidity, a hydrometer measures the density or a specific weight of a liquid. Humidity, also called relative humidity or air humidity, is defined as the amount of water vapor in the air. However, humidity is relative. It is normal and even important that air contains water vapor. The amount of water vapor in the air depends on several factors, including the temperature of the air. Warm air is generally more humid than cold air. This means that when air temperature decreases, the maximum amount of water the air can hold also decreases. A hygrometer displays readings in a percentage of relative humidity (% RH). So, if a hygrometer displays a measuring result of 20% RH, then the air holds 20% of the maximum amount of water possible at that temperature. When the air is humid outdoors, water and sweat evaporate more slowly. Fog, dew and precipitation become more likely. Indoors, high humidity can trigger symptoms for those suffering from allergies, asthma and chronic obstructive pulmonary disease (COPD). Excessive condensation also can form in overly humid indoor environments, resulting in the growth of mold and bacteria. However, when the indoor air is too dry, skin becomes itchy and dry and can even crack. Some people also experience problems with nose bleeds in very dry climates. When the air is too humid indoors, it can sometimes be enough to simply open some windows and doors. Other times, the performance of the HVAC system should be evaluated by a trained professional. In extreme cases, a more complex measure must be taken, like the installation of an extractor fan. In many instances, a reliable hygrometer can be used to identify the root of the problem.